At UWTSD we fully embrace and support student-led initiatives, and want to hear all about what you’re up to on your campus. “At one point or another we will all be affected by cancer – whether directly or indirectly. 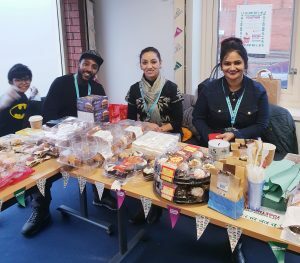 In response to this, student reps at Birmingham campus took the initiative to host coffee mornings in December, raising a brilliant £528 for Macmillan Cancer Support. The campus also welcomed the family of one of students who recently passed away to see his place of study and to also take the messages of “Hope and Legacy”, to keep as memories. Many of the students were affected by the loss of a friend and poet who had embedded his presence in the campus. 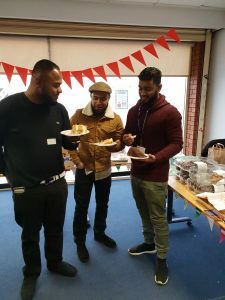 It was amazing to see the common room full of students buying cakes and drinks, sharing their stories with emotional impact to those who heard. The event promoted conversation and ideas for future events. Student Experience Officer Angela Leonard added, “I would say that our student reps demonstrated their passion and drive to facilitate a successful event, supported wholeheartedly by their fellow peers”. Well done to Helen, Tespha and Ananya, who took the lead in organising the events, joined by Davina and others, investing their time and contributions. If you would like to share a story or contribute a guest post, we’d love to hear from you. Email sed@uwtsd.ac.uk.